Student Sleuths Seek Clues in Indian Painting University Collections teamed up with the Art History and Chemistry departments at W&L to examine a tiny painting surrounded by mystery. During Fall Term 2016, Melissa Kerin and her students in the Court Art of India class made a simple visit to University Collections of Art and History (UCAH). But that visit would end up blooming into an interdisciplinary project that incorporated both art and science, and resulted in a clearer attribution of one of the collection’s lesser-known pieces. It involved a small painting (8.5″ by 6″) on paper initially identified as an image of an Indian prince, and dating from the Mughal imperial period of India, which could mean anywhere between 1526 and 1857. This piece was one of two that the students in Kerin’s class looked at carefully during their first visit to the collections. Both pieces were part of a gift to W&L made by Elizabeth Otey Watson, wife of alumnus William Clark Watson ’29, who was employed by Standard Oil Company. They lived abroad in Canton, Bangkok, and Taiwan for 18 years prior to returning to Lynchburg, Virginia, in 1965. During their time overseas, the couple amassed a collection of Asian art and furnishings, much of which Mrs. Watson later gifted and bequeathed to Washington and Lee. She also established the Watson Pavilion in her husband’s memory. Initially armed with magnifying glasses and gloves, the students examined the paintings that were framed under glass and speculated about dates they may have been created, which ranged widely between the 18th and 20th centuries. Sparked by the students’ enthusiasm, Pat Hobbs, UCAH associate director and curator of art and history, offered to dismantle the works from their frames and make them available the following week. A second meeting was set up and subsequent examination revealed more details and generated more questions. This was when students and professor alike began focusing on one of the two paintings: that of a turbaned man in profile, clad in white robes and sitting regally in the center of the composition. Questions about the painting’s pigments and authenticity quickly surfaced. One student, Kalady Osowski ’19, who had taken the Science in Art class with chemistry professor Erich Uffelman, suggested we invite Professor Uffelman to look at the painting using his world-class equipment. Hobbs and Kerin met with Uffelman, Visiting Assistant Professor of Chemistry and Biochemistry Jelena Samonina-Kosicka, W&L student Mike Sullivan and JMU student Madison Whitesell. They examined the work using X-ray Fluorescence Spectroscopy (XRF), a stereo microscope, Ultraviolet-Induced Visible Fluorescence and Infrared Imaging. The students faced the image one last time on their final exam, as they proffered opinions about the identification of the sitter, as well as the possible date of the painting, based on stylistic analysis and their recent findings of their chemical analysis. There is now a consensus that this painting is indeed an original piece, not a 20th-century copy, and it can be tentatively dated to the late 18th century. 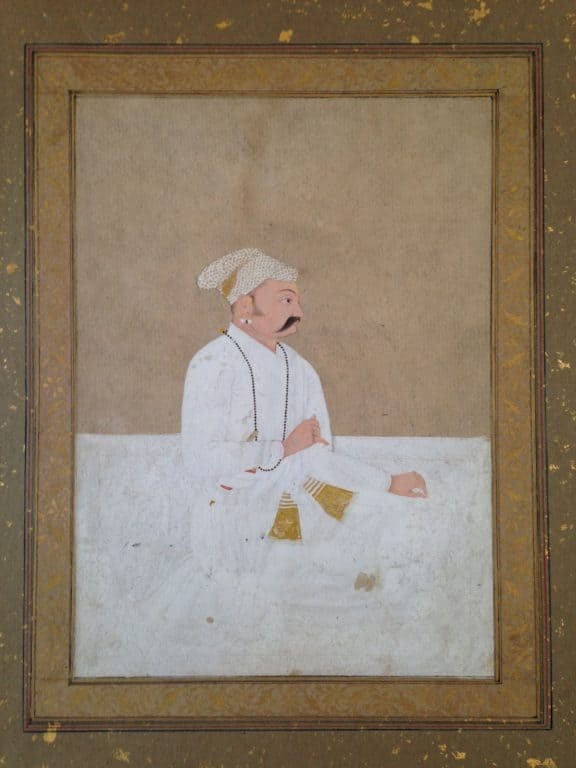 It features the portrait of a Rajput, not Mughal, nobleman. As there is no information about where it was originally painted, there are still a number of unanswered questions about the kingdom from which this Rajput nobleman hailed. Research on this painting will continue, and Kerin plans to share the images and information with colleagues in the field to get their expert opinions, as well. W&L’s University Collections of Art and History will benefit from this scientific, historical and curatorial information as it makes its collections increasingly available to various classes. This is one of three paintings that comprise our collection of Indian art.